The MS Victor Hugo is a 2 deck sailing vessel that sails the Danube river and the Rhine river. lounge-bar with a dance floor, bar, dining room, large sundeck with deckchairs, and gift shop. The MS Victor Hugo is not equipped for the disabled. The Victor Hugo is a friendly and comfortable ship with facilities that include a restaurant, lounge bar and dance floor, gift shop and large sundeck. Passengers on the Victor Hugo tend to be 45+ and Europeans & Americans. Cabins: All cabins are located above water level and offer panoramic views of the scenery. Spacious and comfortable, they have twin beds or a double bed, with a bathroom (shower, WC and washbasin) and towels provided onboard. They are also equipped with satellite television, radio, hairdryer and safe. 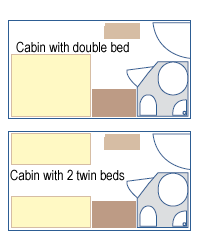 All cabins offer the same equipment and are of the same size.